Black and Decker’s BDH2000FL Platinum 20-Volt Flex Cordless Vacuum is certainly one odd looking handheld vacuum…it looks a bit like a nautilus, and a bit like a miniaturized shop vac. It’s actually an upgrade of an older version of the Flex, with a better battery and longer hose – still odd looking, though. But that doesn’t stop it from being a great vacuum. I’ll show you why. The Flex comes with 20 volts of power. That’s a strong showing for what is actually a relatively light and small vacuum. It’s very strong, in fact, when you consider that it puts this little vacuum right up there with bigger stick vacuums. That power makes the Flex fantastic at cleaning in a couple of different senses. One is pet hair, both with the included, unique pet hair tool and without – it even gets the hairs out of carpet well! Of course, since it’s a handheld vacuum, you’re not going to be doing all of your floors with it, but it’s a blessing on all the corners and angles of carpeted stairs. In a broader sense, this vacuum really shines in the sense that a handheld is supposed to shine – it’s agile, portable, and great for small messes, from kitchen spills to sand in cars. This vacuum gets its name from its most helpful feature: a four foot flexible hose that can reach up into cabinets, across to reach across awkward automobile places, and down and around to get under and behind furniture. There isn’t really a way to make a vacuum more agile than this. And when you’re not using the hose, it conveniently wraps around the Flex’s circular body. Black and Decker has upgraded the new Flex with a Lithium-Ion battery, which is lighter, more efficient, and better in several other ways than the previous Ni-Cad battery. It charges in four hours and provides for up to an eighteen minute runtime – that’s plenty for a handheld. The charging base also has an indicator light to let you when it’s seated properly. This vacuum weighs 3.8 pounds. That’s alright for a handheld, but it’s really not that much when you consider how this vacuum is meant to be used – one hand comfortably holds the body of the vacuum while the other maneuvers the hose wherever it’s needed. There’s no awkward twisting of your wrist to try to direct a nozzle. Black and Decker went with triple action filtration for the Flex, and it’s nicely dishwasher safe. The even better news in this category, however, is a special knob that helps clear the filter without having to open the vacuum, to help keep its suction efficient. To accommodate the Flex’s unusual shape, its dustbin is oddly kind of donut shaped….but it still manages to have space for 17 ounces. That’s not bad at all, especially for a handheld vacuum! This vacuum comes with a nice array of accessories, and they even store conveniently on the charging base. The crevice and brush tool are welcome standards, but the pet tool is a unique design that really stands out in how well it works. The Flex is constructed pretty solidly – it doesn’t feel cheap in any way, if you know what I mean. Also, with a Lithium-Ion battery, there are none of the frustrating battery memory issues that previous versions of the Flex had to deal with. Black and Decker includes a three year warranty with this vacuum. You might be disappointed to not see a battery warranty as well, but the Flex’s battery is integrated into the vacuum itself, so it simply wouldn’t make sense to have a separate warranty. 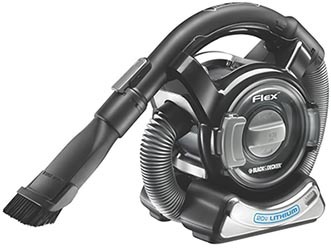 The Flex is definitely up there with other high-end handheld vacuums in price. You get what you pay for in just in its power and versatility alone, however, not to mention its battery and accessories as well. Black and Decker has really come through with continuing to produce and moreover upgrade their Flex vacuum. Going with a Lithium-Ion battery has provided for fantastic power and runtime, and by keeping with the original’s unusual design, they’ve also kept all of its versatility and unmatched reach for a handheld. It’s a winning combination that’s worth the price.